$9.95 In stock. Order in the next 1 hour, 23 minutes and it will go out today! In stock. Order in the next 1 hour, 23 minutes and it will go out today! 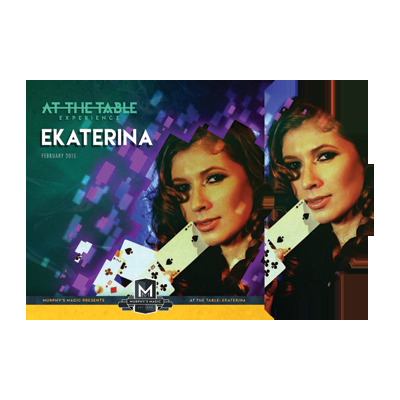 Ekaterina gives you an exciting class in cardistry, magic & showmanship. There is something here for both the complete beginner as well as the more advanced. So break out your cards, and prepare to learn everything from basic flourishes to enhance your magic, to the more advanced and difficult moves to just plain show off. Ekaterina also be covers magic for both close-up and stage as she tips one of the effects for the stage that she performed on Wizard Wars. Ekaterina also performs and explains a few card effects which have never seen print until this event. One of them fooled Penn & Teller! Mix that in with a funny rope-escape routine, and you have yourself an AT THE TABLE EXPERIENCE that cannot be missed!